Enclosed are lots of fun ideas and inspiration for how you can make and decorate Hobbit, Tolkien and LOTR fantasy themed cookie biscuits for birthdays, parties and other events and occasions. Here's a really fantastic range of cookie baking and decorating ideas for fantasy fans who love Tolkien's The Lord of the Rings and The Hobbit too. Enjoy recreating iconic ideas from the books and also the movies: The Unexpected Journey, The Desolation of Smaug and The Battle of the Five Armies. Got a party or event coming up? Don't get stuck for inspiration, bookmark this page for lots of advice and ideas on how to decorate some amazing Tolkien inspired bakes that will be the hit of any party, convention or just as a unique and special treat for a Middle Earth fan. 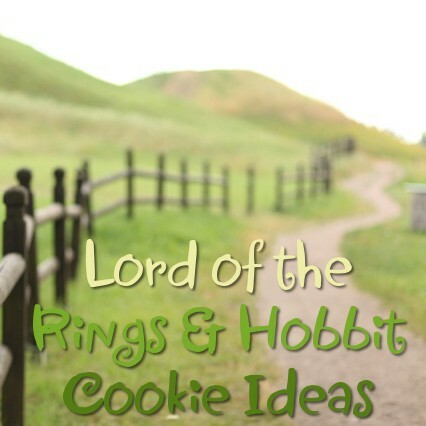 Get lots of inspiration for those fantasy style Lord of the Rings and Hobbit cookies. All these ideas are great for birthdays, celebrations, parties and more. Do you dream of one day living in a home with a beautifully round, green door? I know I do! These sweet sugar cookies were made by the author of this article and are based on the door that you see in the An Unexpected Journey movie. 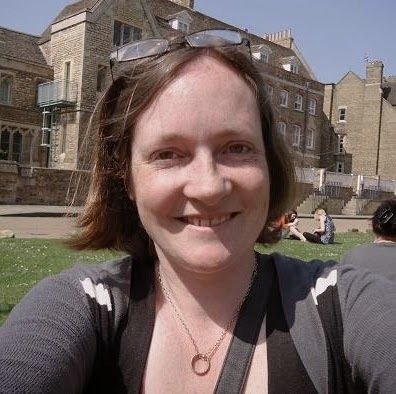 This home belonged both to Frodo Baggins and his older cousin (who he respectfully called uncle) Bilbo Baggins before him. Frodo plays a bigger part in The Lord of the Rings movies. Any fan of The Hobbit or The Lord of the Rings should adore these easy to make designs. They are based on the famous round Hobbit home door that belongs to Bilbo, and later, Frodo Baggins. These are pretty perfect for any aspiring little halfling! We know from Tolkien himself that Bilbo had a round door to his Hobbit home that was painted green. In the exact middle was a gold doorknob. So I based these on Tolkien's actual description of Bilbo's Bag End home. Using a set of different sized circle or round cookie cutters, you can cut out the cookies, some brown fondant icing for the door frame and some green fondant icing for the door. In the middle is some yellow candy coated chocolate to represent the door knob. A small pack of rolled fondant icing to use with your baking is good to start and practice with. This icing is best described as edible play doh because it is easy to squeeze, shape and roll to use on your baked creations. You stick it to the desired surface with a little warmed up apricot jam. A Hobbit is widely recognized by their bare and hairy feet. I've always loved Hobbit feet because it's one sure way to instantly recognize this Middle Earth creature. These Hairy Feet Cookies are such fun and great for kids birthday parties or for grown-ups with a sense of humor. These are perhaps the only feet that actually taste nice enough to eat! You need to make up some plain cookies and cut them out with a foot cookie cutter. Toenails can be added on with melted baking chocolate and a decorating pen. Discover how you can make some deliciously hairy Hobbit feet cookies. Novelty vanilla feet cookies with chocolate hair are a fun project for Lord of the Rings fans to bake and eat. The hairy part is also made using chocolate too but you'll need to refer to the full tutorial to see how that's done. Don't worry since it's actually quite easy to do. You'll find plenty more ideas below that you can use too. Celebrate a real love of Tolkien's most popular fantasy books. 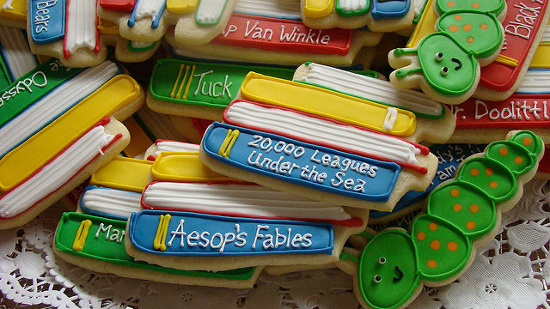 What a great idea this is for cookies - some cookies that show off the spines off books with the titles iced on with a food decorating pen. You can easily adapt this cookie books idea for your favorite Tolkien books: The Hobbit, The Lord of the Rings and The Silmarillion. There isn't a tutorial for this but I can guess that you need a rectangular cookie cutter for the main cookie shape which you then cut away at to make it look as though you've got a stack of 3-4 books. You can also use an open book cookie cutter for a different look. Cut out rolled fondant icing in different colors for each book or pipe on royal icing. Then use a fine icing writer pen or edible food marker to add on the names of one or two Tolkien books neatly. Bilbo braves the rather hideous Giant Spiders in the dark and dreary Mirkwood Forest. Mr Baggins was a very unlikely hero in The Hobbit. He really doubted himself and his strength of character during much of his journey with the dwarves to the Lonely Mountain. But he was stronger than he thought and saved himself and his dwarf companions on several occasions. One of those was when he came up against some giant spiders in Mirkwood forest who felt the force of Bilbo's sword - Sting. You can celebrate Bilbo's hero turning point by making some giant spiderweb cookies. 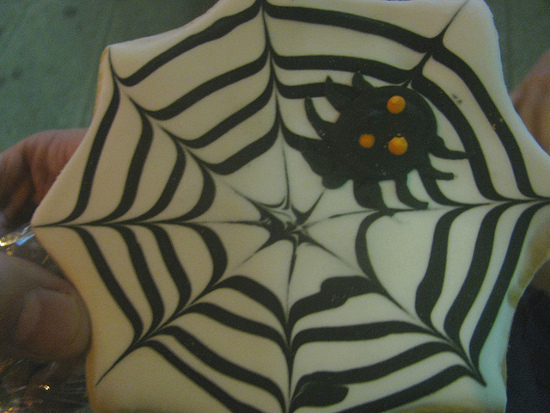 You need a spiderweb cookie cutter and some royal icing in white and another contrasting color like black. Watch the video above to see how you ice these amazing spider treats. 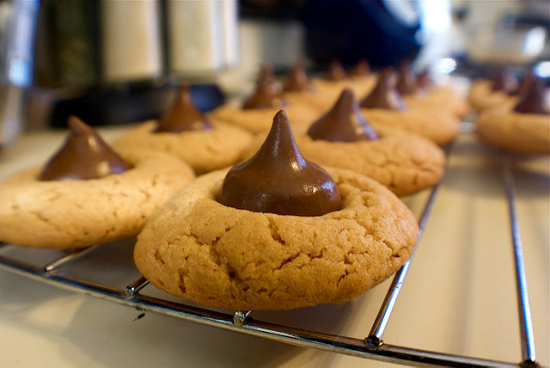 Hershey Kiss Cookies are a brilliant and easy way to conjure up some treats that look very similar to a witch or wizard hat once made. OK so Gandalf is best known for his long gray pointed hat. You can find a Wizard Hat Cookie Cutter and then ice it in gray if you want to be more realistic. But I love these fun, chocolate cookie biscuits which are really tasty treats. Make sure you watch the video above to see how these are made. Elvish leaves taste much better this way! 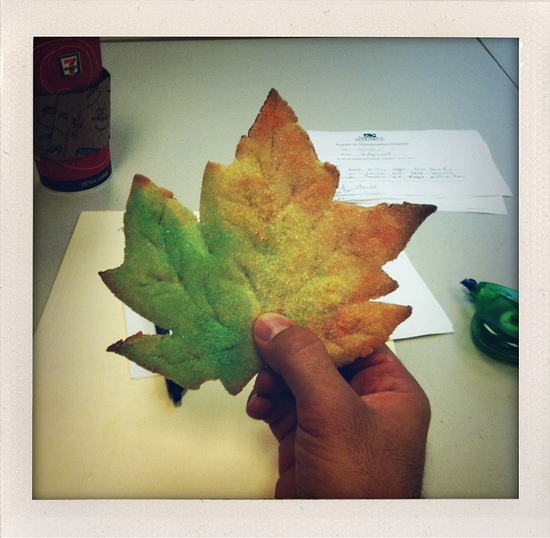 OK so these are actually not magical but Maple Leaves in the image. However, you can easily make up some Elvish or Elven Leaf designs instead. The typical leaf shape which is used in The Lord of the Rings Movies is a 3 pointed leaf. This shape might be hard to find but you can use a single leaf and then cut two smaller versions and stick these to either side to make up something that's similar. The trick to make your Elvish Leaves look truly magical, is to add some edible glitter on top. Simply brush the unbaked dough with a little egg white and sprinkle your luster dust or glitter over the top. Then bake your cookies as normal. Bilbo and other Tolkien halflings simply love dressing up in their dress vests or waistcoats. What is it with Hobbits and this style of fashion? I love the way that they dress with such a unique sense of style. This fun sense has been captured in this dress vest design. The plain sugar cookies have been cut with a circle cutter. You need to choose some ready to roll fondant icing in a suitable color and cut these with the same round cutter. Then it's a case of cutting away at the fondant until you have a great waistcoat or dress vest shape. Stick this onto a cookie with a little, warmed-up apricot jam which acts like glue when it dries and add some chocolate candy coated buttons. Let me know about what you might make in the comments below.